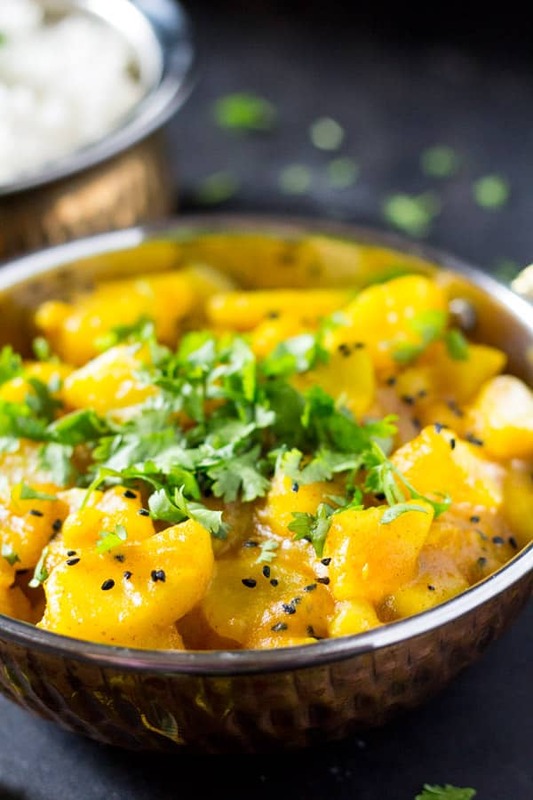 This Potato Curry recipe aka Aloo Bhujia is the best friend to your naan or steamed rice! 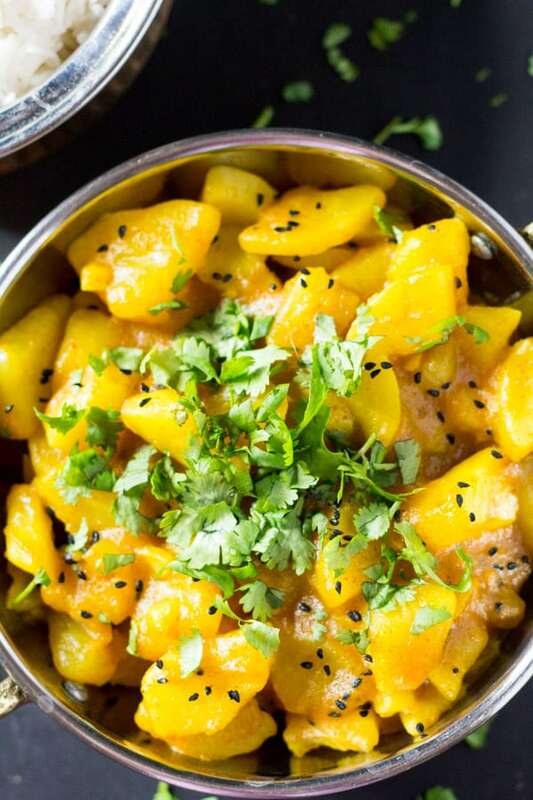 I know, I know it’s hard to beat chicken tikka and chicken korma curry, but this Potato Curry is amazingly delicious, and only requires six ingredients. All of which are available in your pantry right now, I can bet! I love how most Pakistani and Indian recipes are one pot recipes, and this potato curry recipe is no different. If you’re looking for more South Asian recipes that are made in one pot then do check out my recipes for Daal and Chicken Karahi. It’s amazing how the simplest of flavors and ingredients can come together to make such a delicious dish. Seriously don’t believe me? This potato curry recipe is known most commonly as Aloo Bhujia in Pakistan, and I swear it’s probably the easiest recipe I’ve ever made. Seriously, I’ve made this with a toddler clingy to my legs…that’s proof this is legit an easy recipe. All you need is a side of rice with this aloo bhuji (potato curry recipe) and / or naan. Okay, so strictly speaking you do need salt, water and oil but such basic ingredients aren’t counted as real ingredients right? 😀 😛 Just like this easy chickpea curry, this Indian Potato Curry is also ready in 30 minutes, which means it’s faster than take out. And of course, much more economical too! Also, I’d like to add here that indian potato curry is made differently in every household. Some add onions, some add tomatoes and some add both tomatoes and onions! 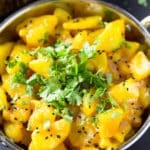 I’ve made all kinds of Indian potato curries, but I feel this one is the tastiest and easiest! In other words a total win in my recipe book (ahem, blog!) lol. And here are a few tips to make sure you indian potato curry process goes smoothly. 1.) So the most important tip here, is to chop the potatoes into small cubes so that they cook through quickly and are softened and become all yummilicious! 2.) Fresh coriander adds a delicious flavor to the recipe so please do not skip it! And it cannot be replaced with parsley because both herbs have distinct flavors. 3.) If you feel the water is drying up too quickly and the potatoes haven’t cooked through, then add an additional 1/2 cup of water and put a lid on the pot. The potatoes will cook through in the steam. 4.) The nigella seeds are optional, so if you don’t have any at home, you can skip this ingredient. The potato curry will still tasted delicious! 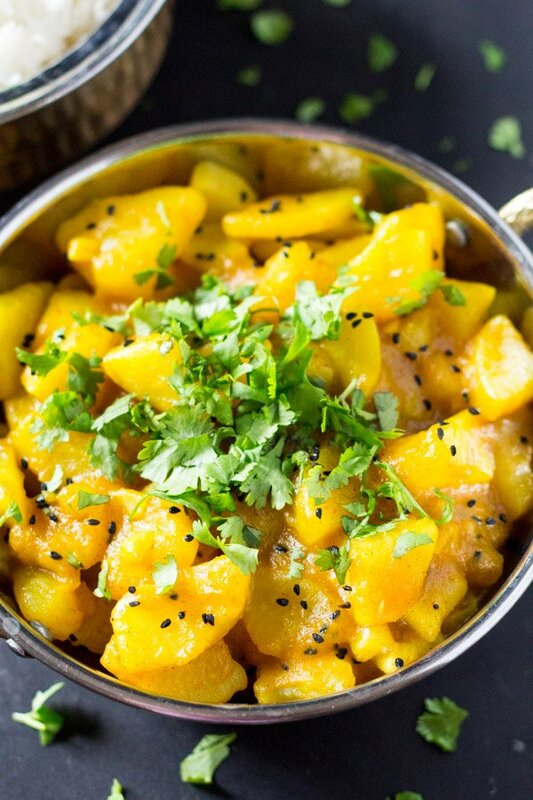 This six ingredient potato curry is super easy and delicious! It doesn't require any special indian spices and is ready in just 30 minutes! 1 bunch coriander finely chopped. Heat oil in a medium sized pot on medium heat, and add the garlic paste. Cook for 30 seconds and then add the potatoes. Cook for about 2-3 minutes. Now add the spices (red chili powder, cumin powder and turmeric powder) and cook for 10-15 seconds and then add the water. The potatoes should be almost completely submerged in the water. Cook on low heat until the potatoes have cooked through and the water has evaporated. The curry will be thick in consistency. If the potatoes aren't cooked through then add additional water (about 1/2 cup water) and cook until the potatoes are cooked through. Add in the nigella seeds and cook for 30 seconds. Add in the coriander and cook for 30 seconds. 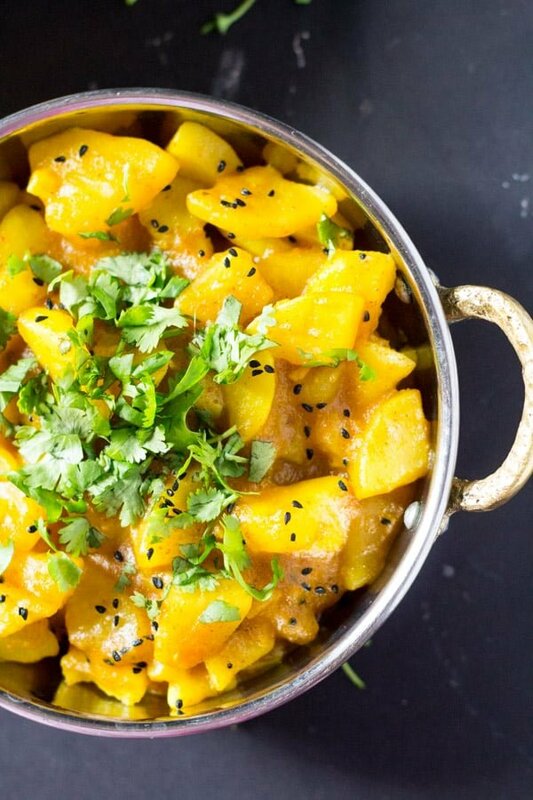 I’ve never heard of a potato curry but the photos look amazing! Do you eat is as a main or it is a side dish? Didn’t thicken, had to add cornstarch. Hi Lala! I’m sorry the curry didn’t thicken. Do you think you could have added too much water? I make this curry at least once a week, but have never had to use any thickening agent. Hope this helps! this is fantastic!!!! I just finished dinner. I simply loved this dish. No coriander where i live but i topped with chives and sour cream. Needless to say, i finished mine and hubby’s plate and had one more serving myself. I love it!